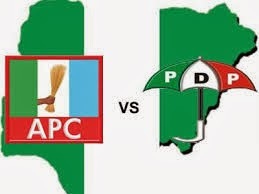 Top officials of the All Progressives Congress (APC) and hundreds of their supporters from Jos South Local Government Area of Plateau State have defected to the Peoples Democratic Party (PDP) to align with the Chairman, House Committee on Rules and Business in the House of Representatives, Hon. Edward Pwajok (SAN). The APC legal Adviser, Hon. Joseph Mani, who led the defectors, said they were leaving the APC because the party had nothing good to offer Nigerians. His words: “We are defecting to the PDP to support Hon. Edward Pwajok in mobilizing massive votes for Alh. Atiku Abubakar, presidential candidate of PDP, Sen. Jeremiah Useni, Plateau State Governorship candidate and all PDP candidates in Plateau State. “We believe that with Atiku as President and Useni as Governor of Plateau State, Nigerians will have peace and IDPs in Plateau State would be resettled to their various places of abode. APC is full of deceit, they have been complaining every day because the party has nothing to offer. Pwajok said with Atiku, hunger, insecurity and economic recession would become a thing of the past and naira will regain its value, while the Nigerian economy will bounce back. A former Minister of Youth and Sport and Plateau State PDP Chairman, Hon. Damishi Sango, who received the defectors in Barkin-Ladi Local Government Area of Plateau State, said PDP was the only party that had concern for the security and welfare of Plateau people.